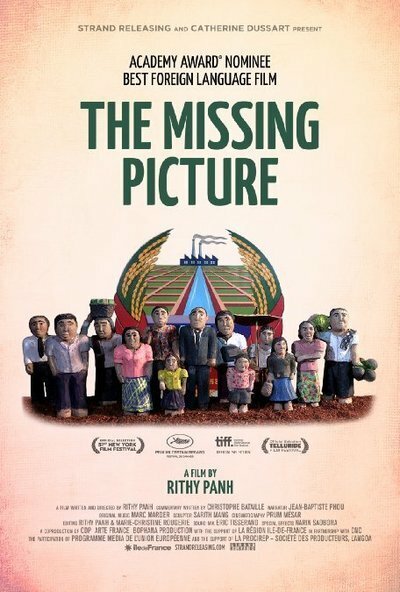 With "The Missing Picture," writer-director Rithy Panh takes a daunting and emotionally draining topic—the atrocities Cambodians suffered under Pol Pot and the Khmer Rouge—and presents it in a way that's personal, imaginative and even strangely beautiful. It's a story the documentarian knows all too well because it is his own. Panh was just 13 in 1975 when he and his family were hauled away from their home in Phnom Penh along with million of others to toil in labor camps for the purpose of creating a Communist utopia. "You must embrace the proletarian situation," they're told—the repeated slogans ringing in their ears over loudspeakers as they slave away in the mud and the dirt and the rice fields. Panh depicts the horrors he suffered and witnessed in a way that makes them unexpectedly accessible: He uses hand-carved, meticulously painted clay figurines, arranged in elaborate dioramas. There are hundreds of them with a wide array of expressions and experiences: women carrying fruit, kids playing with a dog and—once the army invades Cambodia's capital city—armed soldiers and starving, dying workers. With its use of mixed media, Panh's film is reminiscent of other recent documentaries that have explored ugly, violent times in world history from an unexpected perspective. "The Act of Killing," which was nominated for an Oscar in the documentary-feature category this year, depicted Indonesian death-squad leaders reenacting their crimes in theatrical ways. In the animated "Waltz With Bashir," Israeli director Ari Folman revisited fellow veterans of the 1982 invasion of Lebanon to piece together memories of his own actions. Panh matter-of-factly recalls watching his father choose to starve to death rather than suffer the indignity of eating animal food. Similarly, he remembers daring to break the rules and trap a fish, only to find his mother had died by the time he brought it back for her to eat. But there are a few upbeat memories too. A cluster of colorfully dressed clay figurines stand around a television in a flashback scene, watching the Apollo 11 moon landing. And there's a rare burst of what looks like sheer joy in an archival clip as a bunch of kids at the camp smile and play in the pouring rain. His approach is thrilling and clearly took an enormous amount of time and painstaking effort. But the novelty of the film's look fades after a while and Panh's storytelling, vivid and harrowing as it is, also ends up feeling redundant and wearying. His use of nearly constant narration—the work of Randal Douc speaking his words in the first person in the French, subtitled version—can be hypnotic in its intimate monotone. But as an examination of memory and experience and how they shape us, "The Missing Picture" is meaningful beyond its specific subject matter. Panh has stories to tell that will chill you to the bone, but what prompted him to dredge them up is a sensation we'll all experience at some point: He reached middle age and began questioning the purpose of his existence. "I seek my childhood like a lost picture," Douc says on his behalf in the film's opening voiceover. "Or rather, it seeks me." With "The Missing Picture," Panh sought—and found—his own hard-earned truth.